A residential whole house reverse osmosis unit consists of more than just the reverse osmosis unit itself. Usually, some pretreatment will be needed, a storage tank is required, and the water will then have to be post-treated and pumped into the home. There are many excellent residential whole house reverse osmosis units on the market. They are usually classified according to the number of gallons per day of “permeate” (finished water) they are rated to produce. GPD ratings are purely theoretical: the actual production depends on the nature and conditions of the treated water. TDS (total dissolved solids), for example, affects production rates considerably, as does water temperature. When furnished a detailed water analysis for the water to be processed, RO manufacturers will usually perform an analysis called a ROSA test that gives a fairly accurate prediction of the actual production and the quality of the finished product. Axeon AT Series RO Unit. Units in this series produce in the 500 to 1000 gallon-per-day range. When you get the unit, it has been run and tested–it’s ready to install and use. Typical GPD sizes for residential RO units are 500, 1000, 1500, and even more. Sizing adequately is important, and over-sizing a little doesn’t hurt. A lot more capacity than you need, however, is not good for the equipment. RO thrives on work and it’s better for the equipment to run several hours per day than to make an occasional short run and shut off. Consider your household needs. Unless you have special uses like extensive irrigation, about 75 gallons per day per person is usually enough. Keep in mind, however, that you might get only 200 gallons of actual output from a 500 gallon unit and the unit might have to run virtually continuously to keep up with the demand, so a 1000 GPD unit might be a better choice for a two-person home than a 500. In most cases, too, 1000 costs only a bit more than 500, and larger units are usually more efficient than small ones. 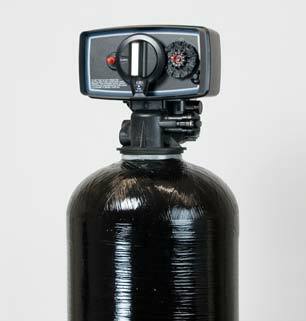 Reverse osmosis can tame some very challenging water by reducing dissolved solids levels by almost 100% and removing arsenic, nitrates, and lead, and other problem contaminants, but the RO membranes themselves must be protected from contaminants like iron, hardness, manganese, turbidity, silica, and chlorine. Pretreatment can require an iron filter, a water softener, sediment filtration and/or chemical scale inhibitors. Pretreatment is not optional. Although the RO unit can itself remove the calcium that causes hardness scaling, untreated hardness will eventually scale the membrane, and membrane replacement is costly. Keep that in mind when considering a whole house RO installation. Consider, too, that iron filters and softeners have to be allowed some time to regenerate themselves when the RO unit is not running. This can affect sizing. 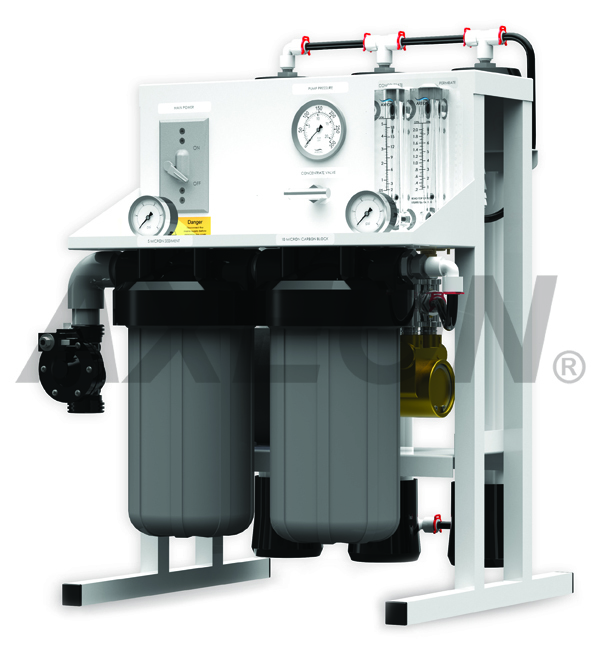 Filters and/or softeners may be needed to pre-treat water for iron, hardness, sediment–anything that can damage the reverse osmosis membrane. RO water is naturally low in pH, so it often a good idea to send it through a small neutralizing filter (usually calcite) to bump the pH back into the 7 range. This protects plumbing fixtures and can make the water more aesthetically pleasing. Also, after the water has been stored in a tank, a small carbon postfilter will improve the taste. Finally, an ultraviolet lamp can assure safe, bacteria-free water. Calcite, carbon filters, and UV are all optional, but you should consider them seriously. Reverse osmosis units make water slowly, so storage is necessary to assure that enough water will be on hand for domestic needs. The standard whole house RO storage vessel is a plastic, un-pressurized (atmospheric) tank. The RO unit produces water into the tank; when the tank is full, a float valve turns off the RO unit. When the water level drops, the float valve restarts the RO unit to refill the tank. To send water to the home, a delivery pump is used. Some modern pumps (Grundfos is the leading brand) require no pump tank and send a smooth surge of water to the home when a faucet is opened or an appliance asks for water. Common tank sizes are 165, 300, 500, and 1000 gallons. A 300 gallon tank is plenty big for most domestic RO installations. Keep in mind that if your RO unit is a high producer, you can get by with a smaller storage tank. Typically, RO tanks need 4 holes. One on the side near the bottom from which water is sent to the home, one for the float valve, one for RO water to enter the tank, and one to serve as an overflow safety device in case the float valve fails to turn off the RO unit. The last three holes are near the top of the tank. Something people often fail to think about when they consider installing whole house reverse osmosis is the brine, or “waste water.” There will normally be a lot of it. You’re almost certain to have at least as much brine to get rid of as good water to use. You probably won’t want to put it into a septic tank. What you’re going to do with the brine is something you should work out before you purchase a whole house RO unit.